The Seventieth United States Congress was a meeting of the legislative branch of the United States federal government, consisting of the United States Senate and the United States House of Representatives. It met in Washington, D.C. from March 4, 1927, to March 4, 1929, during the last two years of Calvin Coolidge's presidency. The apportionment of seats in the House of Representatives was based on the Thirteenth Decennial Census of the United States in 1910. Both chambers had a Republican majority. Democratic Campaign Committee Chairman: Joseph W. Byrns Sr. Senators are listed by class. They were elected every two years, with one-third beginning new six-year terms with each Congress. Preceding the names in the list below are Senate class numbers, which indicate the cycle of their election. 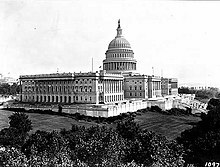 In this Congress, Class 1 meant their term ended with this Congress, requiring re-election in 1928; Class 2 meant their term began in the last Congress, requiring re-election in 1930; and Class 3 meant their term began with this Congress, requiring re-election in 1932. Members of the House of Representatives are listed by district. (3) Vacant Election of William S. Vare was not certified by the governor, and the Senate refused to seat him. Vacant Seat remained vacant until the next Congress. (3) Vacant Frank L. Smith was not permitted to qualify, and resigned February 9, 1928. 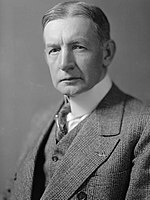 Successor appointed December 29, 1927. Successor appointed March 31, 1928. (3) Frank B. Willis (R) Died March 30, 1928. Successor appointed April 4, 1928. (3) Frank R. Gooding (R) Died June 24, 1928. Successor was appointed to continue the term. (1) Bronson M. Cutting (R) Did not run to finish the term. (3) Cyrus Locher (D) Lost nomination to finish term. (2) T. Coleman du Pont (R) Resigned December 9, 1928. Lists of committees and their party leaders, for members (House and Senate) of the committees and their assignments, go into the Official Congressional Directory at the bottom of the article and click on the link (3 links), in the directory after the pages of terms of service, you will see the committees of the Senate, House (Standing with Subcommittees, Select and Special) and Joint and after the committee pages, you will see the House/Senate committee assignments in the directory, on the committees section of the House and Senate in the Official Congressional Directory, the committee's members on the first row on the left side shows the chairman of the committee and on the right side shows the ranking member of the committee. Official Congressional Directory for the 70th Congress, 1st Session. Official Congressional Directory for the 70th Congress, 1st Session (Revision). Official Congressional Directory for the 70th Congress, 2nd Session. Official Congressional Directory for the 70th Congress, 2nd Session (Revision).